Still-wrapped Safeway Bakery Counter light fruitcake slices. Convenient serving size! Fruitcake doesn’t do anything for me. I think. See, I can’t say I’ve had all that much fruitcake in my life. Like many people, I tried it once or twice years ago, decided I didn’t like it, then neglected to try it again because I assumed I still didn’t like it. This is crazy, of course. How many things do you love now that you hated a decade or two ago? I grew up hating cilantro, but now I love it. Anything more adventurous than mild cheddar once made me wince. Now? I love yummy cheeses, though my tastes aren’t entirely freak-show exotic. To mark the season, I wanted to give fruitcake a do-over. Part of my bias probably stems from the legend that surrounds fruitcake. It’s a go-to punch line in any hack comic’s holiday set, the sort of thing the Air Farce would make fun of to their guffawing audience’s delight. I wanted to try it again because I didn’t want to be one of those people who simply dismiss it because it’s fruitcake. I wanted to taste it again for myself. Blessedly, a single slice of fruitcake demands much less commitment than a full fruitcake, especially if you’re the only person eating it. Since a single slice has more calories than a chocolate bar, a full cake’s waistline damage is unthinkable. Thank you, Safeway, for discovering the need for single-serving fruitcake slices. 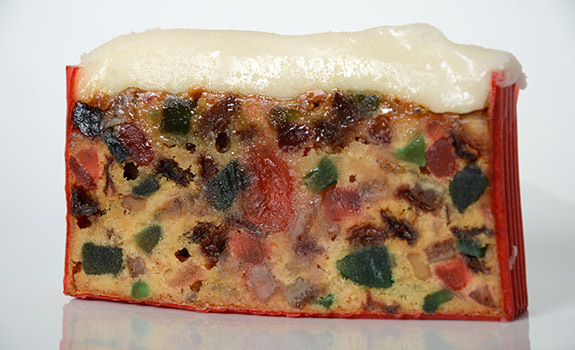 A cross-section of Safeway Bakery Counter light fruitcake. A single slice per holiday season is plenty for many folk. 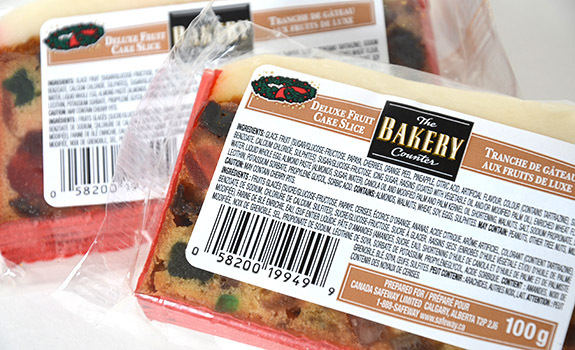 The Pitch: “Deluxe fruit cake slice.” I love the idea of a small amount of fruitcake, purpose built for those festive folk wandering the deli looking for an afternoon snack, or for the fruitcake-curious who don’t want to drop $9 on a cake they may hate. The Look: A slice of fruitcake, including the paper wrapper on three sides and a generous layer of almond paste on top. It’s light fruitcake, so it’s easy to see the candied fruit inside. In the package, it’s hard to see much of the cake at all, as two giant stickers on the wrapper cover much of the fruitcake’s exposed surface. The Taste: Reasonably moist, with a soft texture that binds together the dominant candied fruit and nuts, which are harder but not chewy. Very sweet, with that citrus peel taste that divides the country into love or hate camps. I can’t taste any booze in here at all. The best part is the almond paste on top; it’s super-sweet but wonderful. Cost: $1.99 for a 100 gram slice at Safeway in Calgary. Availability: Safeway. Check the deli. Other fruitcakes are everywhere, though. Nutrition? : Per slice (100 grams): 330 calories, 6 grams of fat, 135 mg of sodium, 1 gram of fibre, 3 grams of protein. Oh, and 51 grams of sugars. Eep. The verdict: You know what? It’s OK. A slice will do me for the season, but I don’t hate it. I’m not sure if I wanted to love it or hate it, either. Either would have been more satisfying than a solid “meh.” But “meh” is what it gets.